"Count your blessings, not your worries"
1. She is a healthy baby and came out healthy. 2. Her lungs are strong. 3. She is awake and alert when we are there. 4. Her eye test was great. 5. Her brain x-ray was great. 6. She is responsive and has a good/beautiful cry. I could go on and on. I have so much to be grateful for and I really can't focus on the things that there are to worry about. As of Tuesday night Noelle weighed 3 lbs 12 oz. Yay! Our little girl is growing :). 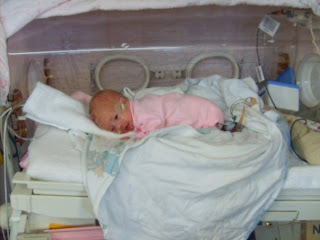 I know that doesn't sound like a lot but it is compared to the 2 lbs 15 oz she was when she was born. She has been moved to a different room. They call the room she is in now the "feeder and grower" room because nothing is wrong other than they need to learn how to eat and need to grow more. Right now she is in a little enclosed bed called an isolette. This is to help her to maintain her own body temperature so that she can grow more. I was able to help the nurse give her a bath the other night. I loved doing this. Noelle loved being in that warm water and almost seemed liked she had a smile on her face the whole time. 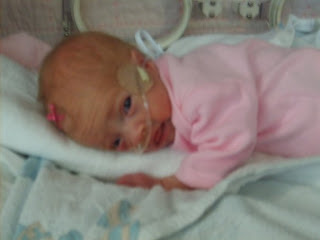 She is moving tons and we get to dress her in her tiny, cute preemie clothes. Michael loves being with her and holding her. He is so confident at picking her up and changing her diaper, I am amazed. He's definitely more confident than I am. He loves being her dad and she already has him wrapped around her little finger. He has had a cold the last couple of days and hasn't been able to see her. This has made him so sad. Soon he'll get to go back and hopefully I don't get sick. Michael has been my anchor and my everything through this. I am amazed at the faith and strength that he has. He has been my shoulder to cry on and has comforted me more than he will ever know. I love him so much. I am so grateful to my Heavenly Father to have him and to have a beautiful daughter. Our surprising and quick arrival of Noelle! This week has been the craziest week for me and Michael. So much has happened in such a short amount of time so bare with me as I try to summarize everything into a few paragraphs. Monday (Oct. 27) I went in for a doctors appointment thinking that everything would be normal. The previous week I had done two seperate 24 hour urine tests. One of the tests had come back and my doctor said that my protein level was really high. I don't remember the exact numbers but it was higher than normal. So because of this and that my blood pressure was still up he told me to pack an overnight bag for the hospital. Thank goodness Michael was there because this came as such a shock. But I stayed suprisingly calm. We got a bag packed quickly and we left for the hospital. We checked in and they put us into a room, where I of course got the chance to put on one of those lovely robes and layed on the bed until the doctor arrived. My mom got there, which was a great comfort. Before my doctor came they wanted to give me an ultra sound and have some kind of specialist look it over to see if there was anything else going on. As far as the baby was concerned everything was pretty healthy. Her heart was beating at a healthy pace and everything was developing well. She was a little small for how far along I was (32 weeks). The specialist came in and noticed the blood flow from the umbilical cord. She said that it wasn't quite pumping enough blood and nutrients and this had something to do with my placenta. (I know this isn't that clear, but it all happened so fast.) My second urine test came back with an even higher amount of protein in it. So she said that I had chronic hypertension and preeclampsia (toxemia) and that because of the high blood pressure I could have a seizure or a stroke and this would be very dangerous on the baby. She strongly suggested that we have the baby delivered as soon as possible. As you can imagine I'm getting a little emotional at this point, but still doing okay. My doctor got there and said the same thing. Because the risk was so high of having a stroke or a seizure he wanted to do a c-section because this was the fastest way to get her out. So within an hour I was drugged up as much as possible and on my way to the operating table with Michael by my side. Before this Michael, along with my doctor, had given me a blessing. I don't remember what was said, but I do remember feeling peace. Within about 30 minutes Noelle was pulled out. She was born at 6:38pm, weighed 2lbs 15 oz and was 16 inches long. I was awake the whole time but couldn't feel a thing. As soon as they pulled her out Michael started taking pictures with my cell phone (this was the only camera we had at the time). 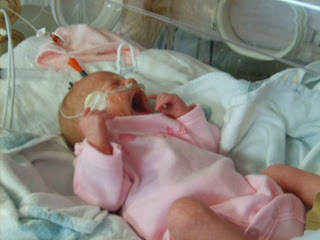 She also had a pretty healthy cry which doesn't happen a lot with preemies. I was moved from the operating room into my normal room where I just had to wait and recover a little. Everything happened so fast that I don't think I really got a chance to take it all in. I'm glad it happened fast because it wasn't until later that my emotions caught up to me. The next day (Tues Oct 28) They moved me to another room and that is where I stayed until Friday evening. Noelle is doing really good! She is little but other than that does not have any additional problems. Her lungs are really strong and is only on a little oxygen. The nurses say that she is a fighter because she tries to pull the tubes out of her body every chance she gets. She is the most beautiful thing I have ever seen! 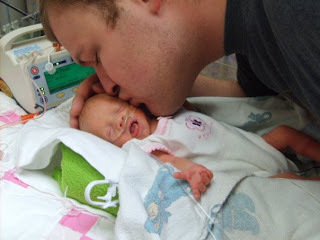 They tell us that they try and make their actual due date the goal of when they get to go home. Sometimes they can go home before and sometimes it's after. We're just trying to be patient and trusting that everything will be okay. So much has happened that I would not have expected. I definitely don't like to see her hooked up to all those machines, it breaks my heart. But I know that she will be okay and that it's all in the Lord's time. Me and Michael are over there every chance that we get. We get to change her diaper, take her temperature and hold her twice a day. Those moments are so precious to us. I wish I had a room right next to her. There's the update. I will give more updates throughout the coming weeks of her progress. We have lots of pictures already and when we get a chance will put them on here and facebook. We've had so much support from friends and family and the Lord has blessed us so much. Pray for our little Noelle!